Are you looking for a house to be quiet, but well connected, at your leisure and in a spectacular setting? Look no more! You have found it. -Txikixe: 1 room with kitchen and bathroom. In addition, it has a large garden with barbecue and we also accept animals. If what you want is to visit Euskadi, I can make you a plan. If on the contrary, what you want is to be calm in the area, I will propose some routes ... and if you do not want me to tell you anything ... then I disappear! And if you decide on another house, well, but do not rule out going through this valley, even if it's just a day. It is worth knowing this environment. There is a bidegorri (green way) of 4'5 km to walk with spectacular views. And if you have any questions, call me at 619322252. My husband and I wanted to stay in a rural place away from the city noise. We are country folks ourselves. We rented the self contained apartment from Jorge. the picture on his website do not do justice to this place. It is beautiful, nestled right at the base of a mountain with cows (with the bells on) and sheep grazing on the hillsides. the apartment had a kitchen, dining area, living room, great TV, internet, a fireplace (we didn't need to use it), bedroom, and bathroom. The bed was great! We wanted to be able to cook if we wanted to but a big town was 10-15 minutes away. There is also a well known Michelin star restaurant just down the road from Jorge's home. San Sebastian is about 90 minutes away and Bilbao is 30 minutes away. We also went to the wine region maybe two hours away. The owners will not hover around you and will let you come and go as you please. Parking was great (we rented a car). If we are in this region again we would stay here again. Jorge does not speak English real well but well enough to help out. Do not hesitate to stay here! Our family and friends of ours stayed in this superb traditional country house for 4 nights. We were on holiday with small children and stayed in the biggest apartment.The location was ideal as a base, quiet and we had a lot of privacy, with one of the most amaizing views of the mountain Anboto. The house is beautiful and so peaceful. Jorge, the owner, was helpful and knowledgeable, and made us feel completely comfortable, taking care of any special needs of his guests. 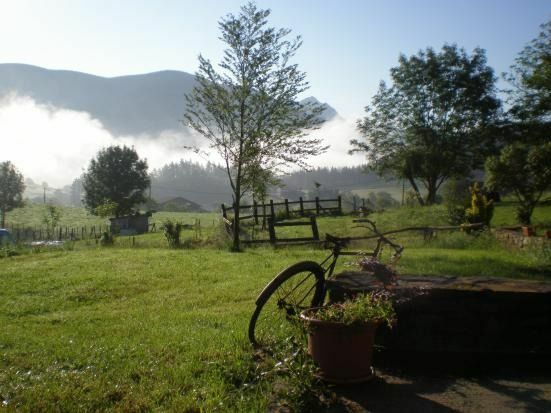 We would highly recommend staying in Olazabal Azpikoa if you want to have a peaceful home-base from which to explore this beautiful part of world. We have just come back from a weekend in the Basque Country visiting the Urkiola and Urdabai natural parks. This accommodation was ideally located for the nearby hiking route along an old mining railway track and visits to Urkiola by car. The house is really well equipped and very comfortable. you have everything you need in the kitchen and the lounge was spacious. We had a great night's sleep and it was very quiet. The owners were very friendly and gave us lots of information on places to visit. Eramos un grupo de amigos dispuestos a visitar el Pais Vasco teniendo de base esta casa rural. Todo fue perfecto. Nos gusto mucho la casa y sobretodo los alrededores. La recomiendo especialmente por el trato recibido por Jorge, su propietario que fue exquisito. Tenemos bastante experiencia en este tipo de alojamiento y hemos quedado muy satisfechos. Sitios y personas así se merecen un diez. Somos Maria y Manuel, hemos pasado una semana en Olazabal y han sido unos días inolvidables. Los alrededores son fabulosos, rodeados de montañas y rutas verdes por todos los sitios, muy cerca de Bilbao y de San Sebastián. Parques Nacionales con rutas preciosas. El trato con Jorge a sido genial, muy agradecidos por el trato recibido, que en todo momento a sido atento y familiar, preocupado por resolver cualquier duda o anomalía que surgiera. Nos ha indicado lugares y rutas para visitar de forma detallada. La casa cómoda y con todo lo necesario ha sido genial y seguramente repetiremos, nos han quedado muchas cosas por ver y Olazabal Azpikoa nos ha encantado. Estuvimos una semana en la segunda quincena de agosto, la casa es perfecta para poder visitar todo Euskadi, ya que está muy bien comunicada con las tres capitales. Perfectamente equipada a la que no le falta ningún detalle ni comodidad. El entorno maravilloso. Estuvimos muy a gusto. El propietario siempre dispuesto a ayudarte y solucionar cualquier pequeña incidencia que surja. Gracias Jorge.